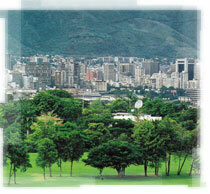 Located in the valley of the Guaire River along the slopes of Mount Avilas National Park, at 30 from the coast. 950 mts above sea level and with an average temp all yeat-round of 20ºC (76ºF) inhabited by around 6 million people. A Cosmopolitan city with important financial and comercial area, cultural activities, night-life, and of course delighful restaurants.